His Honour Judge Rauf SOULIO, Dr Joseph Masika OAM and Hon Senator Kate Lundy Minister for Multicultural Affairs and Minister Assisting for Industry and Innovation. 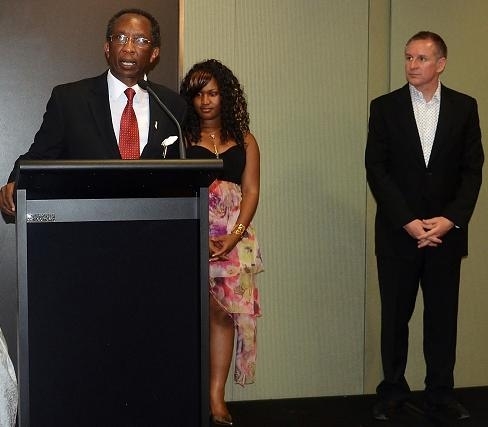 Dr Masika received African Living Legend Award 2012 at Sydney Opera House. My warmest greetings to you – I hope you’ve had a lovely Australia Day. A day for us to reflect on the vibrant multicultural country we share. A day, too, when we acknowledge outstanding contributions to our community. I am feeling an extremely unusual sensation, moreover it’s not indigestion, I believe its gratitude. Thank you for your support. Today, the 26th of January 2013, I was awarded the Medal of the Order of Australia (OAM). 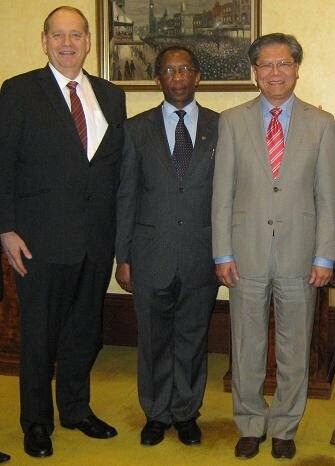 As gazetted today by the Governor-General of Australia, my full name will be known as Dr Joseph Masika OAM. I have no other word to say than Thanks. 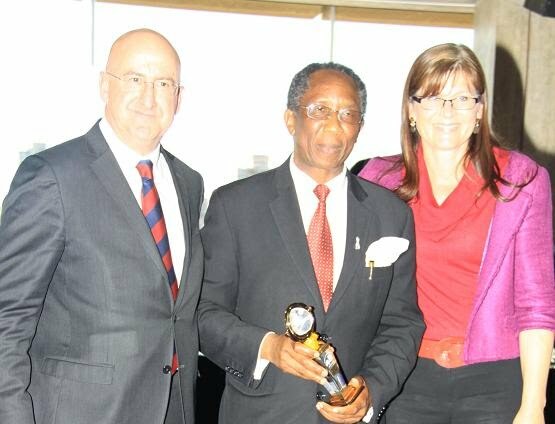 Dr Joseph Masika OAM has given 27 years of voluntary service to the community in Australia and overseas. Dr Masika’s passion has been particularly in migrants, older people, refugees, Disability, Mental Health and multiculturalism. His outstanding contribution to the community has resulted in a considerable community development and his volunteering and advocacy roles have been instrumental in the strengthening of communities, and individuals to ensure that all enjoy a good quality of life in Australia. Dr Masika was a manager of Multicultural Health, Advocacy, Counselling and Education at the Migrant Resource Centre of SA. His impressive credentials include a Medical Degree, Masters in Public Health, Certificate in Management and Leadership, Certificate in Environmental Health from South Australian Centre for Public Health and Post Graduate Certificate in Migration Law. Currently, Dr Masika is Team Leader Intercountry Services |Statewide Services Directorate the Government of South Australia. He is also Commissioner-South Australia Multicultural and Ethnic Affairs Commission: the Government of South Australia. 1. Masika J, Nyamizi Bundara and Lillian Mwanri (2012) - Addressing Undernutrition In Tanzania. Challenges and Opportunities - African Journal of Food, Agriculture Nutrition and Development. 5. Masika, J (2009) Challenges in New and Emerging Communities and Health. The Health Consumer Alliance Voice Summer Edition 2009. 6. Masika, J (2008) African Speak Out Forum Blue Print. African Communities Council of SA Forum in Adelaide, SA. Masika, J. (2009) Settlement Services and Referral Processes: Counsellors in New Arrival Program schools: Department of Education and Children Services in SA. Masika, J. (2009) A profile of new arrivals, including their refugee and settlement experiences: Sexual Health Information networking & education Adelaide SA. Dr Masika is the Chairperson of the African Communities Council of SA since 2007. 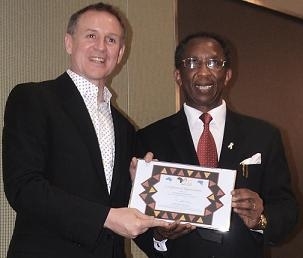 During his leadership he has transformed the association to a better position of being the State peak body grouping 42 ethnic African organisations in South Australia from 20 African Countries. ACCSA represents the interest of these cultural groups and functions as a link between them and the government. The Council provides advocacy, advice and services to the African communities. In addition, Dr Masika is one of the founder members of The African Communities Council of SA in 2000. Australia kept asking Dr Masika to continue with the position of Directorship because of his excellent work of bringing the African Communities in South Australia together in a spirit of unity and support for each other. Dr Masika donated his resources and time to achieve excellent outcome for past seven years as a Festival Director and African community leader. Under the leadership as Volunteer Festival Director, it has allowed the African community to build an extremely cohesive African community in South Australia that now contains more than 55 African ethnic groups. In addition, the African festival has instilled the community peace and harmony among African ethnic groups. Dr Masika fulfilled the goal of bringing together all African Communities in South Australia to celebrate the cultural diversity that exists in Australia and promote the African cultural heritage in the community. 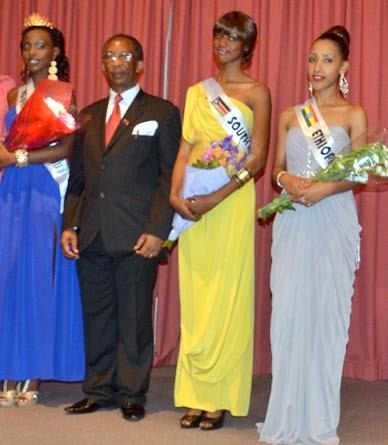 The African Festival has allowed the African community to build an extremely cohesive society. Dr Masika is a respected leader and advocate for multiculturalism in Australia. Dr Masika has always been there to help others since 1996. If you live with him, you will see how accessible he is in providing a helping hand to others. Dr Masika is very influential and well known in the communities in Australia. He can influence and promote knowledge and best practices on cultural pluralism, mutual respect, cultural expression and social participation. The Chairperson: SA African Network to End Silence on Domestic Violence 2008: Dr Masika established the network from his role as White Ribbon Ambassador since 2008 to date: The Network involves African men and boys in the prevention of violence against women and girls. The number of domestic violence in African community was on rise from 2006 and the community witnessed many women taken away into women shelters and many families were breaking apart. Dr Masika encouraged and launched the formation of Liberian Men Association of SA (LIMSA) in 2010 and Sierra Leonean Men Club of SA (KABUDU) in 2009 which helped 150 men around the Liberian and Sierra Leonean Communities to practice and promote a healthy, compassionate, and responsible model of masculinity. Both Men’s association were formed to promote peace, harmony and unity among Liberian and Sierra Leoneans men in South Australia, serve as role models and ambassadors in their communities to end violence against women. Dr Masika has involved African men and other men from Afghanistan, Burma, Iraq, and Bhutan to actively take part in effort to reduce and prevent domestic violence against women in our communities. Majority of New and emerging communities’ members are from Male dominated society and women have no voice and are being treated as second citizen. Dr Joseph Masika is a White Ribbon Ambassador in our New and Emerging communities and he has campaigned against domestic violence and substantially his efforts has yielded positive results of significant number of young people and men’s involved in preventing violence in our communities now days. Dr Masika has delivered more that 35 education workshops on weekends between 2007 and 2011 To End Silence on Domestic violence in African communities. The workshops attracted more than 750 Men, women and youth aged 15 to 25 years old from Congolese, Sudanese, Burundian, Rwandan, Tanzanians, Kenyan, Cameroon, Ugandan, Togolese, South African, Eritrean, Ethiopian, Somalia, Nigeria, Ghanaians and Zambian. Dr Masika has also been advocating for the African women’s rights and equal participation in decision making. As not only a demand for simple justice or democracy but as a necessary action to ensure women’s interest are taken into account in our African communities. He has been tirelessly educating the ethnic groups and their leaders to remove all structural and attitudinal barriers hindering women participation in decision making. The aim is to make African females board members and leaders in the community. Dr Masika’s efforts in African women’s right has been to bring in line the African Culture (especially in the perception that women have no role in decision making in our African communities) to the Australian way of life of equal opportunities and participation in our communities. 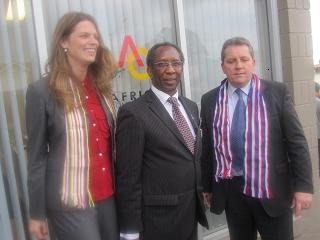 His contribution in this area has promoted African community participation in different levels for both men and women. As results of his advocacy seven women are the president and Vice President of African ethnic associations in South Australia. Health and Aging of the Australian Government to help the Africans to take up physical activity and nutrition issues, strategies to prevent chronic health diseases. The new migrants are susceptible to developing chronic health conditions quickly in Australia because of a range of risk factors including lack of health information knowledge, isolation, poverty and the underlying mental and trauma issues resulting from their backgrounds which made them refugees. AHASA is a non-governmental, non-political, not-for-profit organisation registered in South Australia. AHASA aims to achieve goals through the shaping of multicultural policy through the collection and promote a richer awareness of African cultural heritage in South Australia. Dr Joseph Masika has supported and sort funding for different ethnic schools, Ethnic language radio programs in South Australia. In addition, Dr Masika has been on Swahili program on many occasions at night to encourage the African community members to contribute in discussion and give feedback on major issues happening in South Australia. Dr Masika has always encouraged and supported the parents to teach the children their languages. His contribution is much acknowledged in the community. Associate Board Member of Migrant Resource Centre of SA since 2001 to date, Dr Joseph Masika has always worked with MRCSA management to advocate for the community development to supports new arrivals from Africa, Middle East, Burma and Bhutan to develop as community and to contribute effectively to South Australia’s society, culture, economy and environment. As Associate Board Member of MRCSA Dr Masika has worked with many migrants and refugees groups, helping them to adjust to their new homeland, to become self reliant, and to develop linkages with the broader community and their local ethnic communities. Board member of Multicultural Aged Care Inc (MAC) since 2007 to date. Dr Joseph Masika as Board member has Supported and assisted service providers to give older people from culturally and linguistically diverse backgrounds the services of their choice. Dr Masika was instrumental to the Future Aged Care needs Scoping Study for the African people in South Australia. African people have different understanding of Aged care services and practices in Australia. In Africa, family members have responsibility towards ageing parents and young people with disability. Dr Masika has conducted aged care forums to in African community to raise awareness of the Home and Community Care services in South Australia. 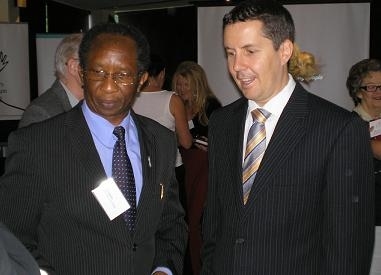 In 2011 HCA conference in South Australia Dr Joseph Masika chaired the vital workshop of the concept of Patient-Centred Care in Mental Health. He shared his experience with other participants that Patient-centred care is an innovative approach to the planning, delivery, and evaluation of health care that is grounded in mutually beneficial partnerships among health care providers, patients, and families. He advocated strongly on patients and other health services consumers that Health services decisions should respect patients’ wants, needs and preferences. Dr Joseph Masika established Australian-Tanzanian Services Foundation in 2010 to assist the underprivileged communities in Tanzania East Africa. The aim and objectives of the foundation is to undertake a direct charitable role. All funds donated to the Foundation are directly channelled to its social development programs in Tanzania and not in any way personally benefited Foundation members. Dr Masika has initiated several projects in Tanzania and he would not mind to assist any community in world. OSHC; and the general safety and educational welfare of the students. Dr Joseph Masika with other Council Members were instrumental on making sure the Forbes’s Children's Centre for Early Childhood Development and Parenting is built by 2010. This is the only one approved so far in the Marion City Council area. Our Children's Centre has included a brand new Pre-School (taking place of Harcourt Gardens), babies and toddlers Child Care facilities, a new Out of School Hours Care centre and Community Health facilities. It was big achievement in our community. Member of Federation of Ethnic Communities Council’s Policy Advisory Committee for New and Emerging communities in Australia since 2008 to date. participate in employment or education pathway if no child care available for their children. the Australian Medical Association (SA) Inc to share his experience and knowledge with different professionals dealing with refugee health Australia. opportunity to acquire Australia work experience. Prescribing Services to provide strategic advice for safe use of medicines to health professionals and Culturally and Linguistically Diversity communities in Australia 2009 to date. Dr Joseph Masika joined the Think Tank of The Multicultural Community Quality Use of Medicines in 2009. Dr Masika contributed towards the best-practice health promotion and community participation processes to promote the quality use of medicines to Australia’s multicultural communities. Dr Masika represents New and Emerging communities in Australia which research has revealed a range of factors that pose QUM challenges for some culturally and linguistically diverse (CALD) Australians. Language barriers, low levels of cultural competency of health systems and the experience of navigating an unfamiliar medicines system contribute to an overrepresentation of CALD Australians in figures for those presenting to hospitals with medicines-related problems. In 2004 and 2005 Dr Joseph Masika conducted 10 workshops to the African Humanitarian New Arrivals in South Australia on quality use of medication. Dr Joseph Masika was instrumental to the establishment of African Communities Councils of Tasmania and in Northern Territory. He travelled to the Northern Territory and Tasmania sometime on his expenses and time to unite the African community. He successfully gave a community a common vision – one of unity, strength and cooperation to ensure that African communities have a strong voice on issues that impact on our successful settlement and wellbeing - and that our voice is heard. Currently, Dr Joseph Masika still is supporting their management as adviser. Dr Joseph Masika is a person considered himself morally bound to help those people less fortunate in the community. He has helped in various ways in t in Rural Tanzania. He is not motivated by money or recognition but driven by compassion and attitude to alleviate poverty, hunger and sickness on his fellow human being. He has demonstrates our need to exercise humanity and compassion for the good of, and for the continuation of, the human race. Executive Secretary: Uru Development Association- Moshi Kilimanjaro region in Tanzania, East Africa - Feb 1993- Feb 1996.